^ Simone-Finstrom, Michael; Spivak, Marla (May–June 2010). 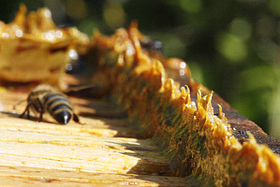 “Propolis and bee health: The natural history and significance of resin use by honey bees”. Apidologie 41 (3): 295–311. doi:10.1051/apido/2010016. ^ Mazzuco, H., Silva, RDdME., Berchieri, A., Jr., de Oliveira, E. (1996). “UTILIZAÇÃO DA PRÓPOLIS E ÁLCOOL ETÍLICO NO CONTROLE DE Salmonella EM RAÇÕES AVÍCOLAS”. Scientia Agricola 53 (1): 1-5. doi:10.1590/S0103-90161996000100001. ^ “Recent progress in pharmacological research of propolis”. Phytother. Res. 15: 561-571. (2001). doi:10.1002/ptr.1029. PMID 11746834. ^ Hashimoto, T., Aga, H., Tabuchi, A., Shibuya, T., Chaen, H., Fukuda, S., Kurimoto, M. (1998). “Anti-Helicobacter pylori compounds in Brazilian propolis”. Nat. Med. 52: 518-520. NAID 110008731910. ^ Bankova, V., Christov, R., Popov; S., Marcucci, M. C., Tsvetkova, I., Kujumgiev, A. (1999). “Antibacterial activity of essential oils from Brazilian propolis”. Fitoterapia 70: 190-193. ^ Serkedjieva J, Manolova N, Bankova V. (1992). “Anti-influenza virus effect of some propolis constituents and their analogues (esters of substituted cinnamic acids)”. J. Nat. Prod. 55 (3): 294-302. doi:10.1021/np50081a003. PMID 1593279. ^ Imai, H., Era, S., Hayashi, T., Negawa, T., Matsuyama, Y., Okihara, K., Nakatsuma, A., Yamadam, H. (2005). “Effect of Propolis Supplementation on the Redox State of Human Serum Albumin during High-Intensity Kendo Training”. Adv. Exerc. Sports Physiol. 11 (3): 109-113　. NAID 110002972712. ^ Moura SA, Negri G, Salatino A, Lima LD, Dourado LP, Mendes JB, Andrade SP, Ferreira MA, Cara DC. (2009). “Aqueous Extract of Brazilian Green Propolis: Primary Components, Evaluation of Inflammation and Wound Healing by Using Subcutaneous Implanted Sponges”. Evid. Based Complement. Alternat. Med. 2011: 8. doi:10.1093/ecam/nep112. ^ Scheller S, Krol W, Swiacik J, Owczarek S, Gabrys J, Shani J. (1989). “Antitumoral property of ethanolic extract of propolis in mice-bearing Ehrlich carcinoma, as compared to bleomycin”. Z. Naturforsch C 44 (11-12): 1063-1065. PMID 2483616. ^ “Induction of oxidative DNA damage by flavonoids of propolis: its mechanism and implication about antioxidant capacity”. Chemical research in toxicology 25 (1). (2012). doi:10.1021/tx200418k. PMID 22148389.